Still holding its own as a special event and gala venue, the Irish-inspired structure's role in this tumultuous period of American history has earned it a place on the National Register of Historic Places, and a top spot on Charleston, South Carolina's extensively long list of important historical sites. 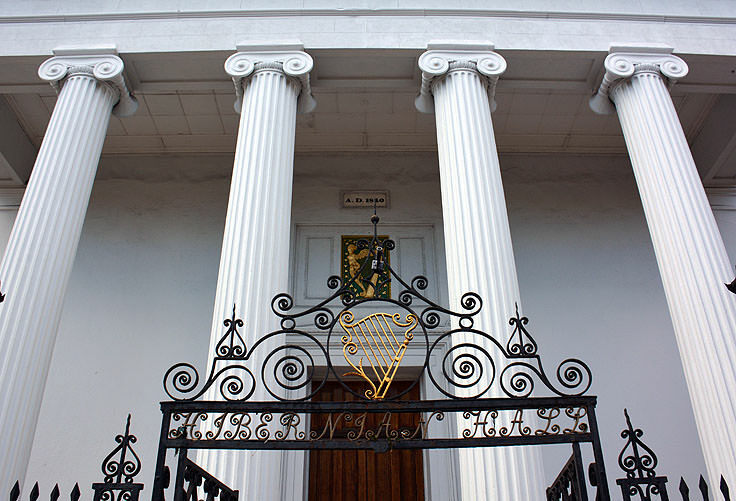 Hibernian Hall was originally built as a meeting place for the Hibernian Society, an Irish benevolent organization founded in 1801 which had a healthy membership in the port town of Charleston in the early to mid-1800s. The building itself was constructed in 1840, and held an architectural distinction as one of the first semi-public buildings to be built in the southern city in the pure Greek style of architecture. Philadelphia architect Thomas U. Walter of Philadelphia took the reins in the design and construction of Hibernian Hall, which included a row of six ornate columns, a flamboyant ballroom and double stairway, and an Ionic pediment which unfortunately collapsed in the earthquake of 1886 and was eventually replaced with a Corinthian pediment with brackets and a center circular-arched window. Honoring the organization's founders, the building also includes stone from Ireland's Giant's Causeway, as well as an Irish harp carved in the panel above the main door, and discreetly placed within the iron gates. 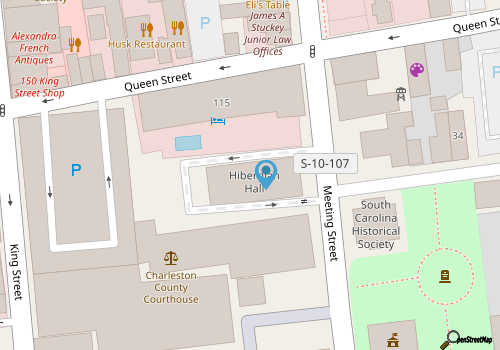 The building was well-received after construction, and fit right into Charleston's growing and surprisingly eclectic forms of architecture which were thriving at the time, and for its early years, Hibernian Hall serve its purpose as a dignified meeting place for the Hibernian Society. This all changed in 1860, however, when the hall was chosen as a venue for a portion of the 1860 National Democratic Convention - a gathering that would effectively change the course of American history. The hall is the only remaining intact building associated with the National Democratic Convention of 1860, and served as its headquarters for the faction of democrats who were avidly supporting Stephen A. Douglas. At the time, it was fervently hoped that this potential candidate would bridge the gap between the northern and southern delegates on the issue of extending slavery to the territories, and during the heated debates that ensued, representatives from all across the country argued back and forth in the heart of Hibernian Hall. The first floor of Hibernian Hall was used as a meeting space, while the second floor housed hundreds of cots for visiting representatives from virtually all of the states. In the end, the impassioned arguments for and against Stephen A. Douglas led to a disintegration of the convention, with no candidate garnering the needed 2/3rds of the majority vote. The indecision and in-party disputes, according to the majority of historians, effectively led to a definitive split in the Democratic National Party, and ultimately led to the election of the Republican candidate, a relatively unknown lawyer named Abraham Lincoln. Because of this brief but vital role in history, Hibernian Hall was named a National Historic Landmark in 1973, and also garnered the honor of housing the South Carolina Department of Archives and History Summary. Today, however, the hall has not veered far from its original goal of providing a meeting and gathering space for Hibernian Society members and the community's elite, and a number of world-class galas, events, and special community affairs are held within the grand ballrooms and meeting spaces. In fact, the Hall still serves as the central location for Charleston's annual St. Patrick's Day celebration, a number of society balls, and other community-oriented social occasions. While the hall is not open to the visiting public, it is well worth a camera shot or two, and can be rented by private parties and community organizations for meetings, celebrations, and even grand receptions and galas. Visitors who are interested in renting the facility are advised to call the hall's coordinators directly at 843-723-4752 for more information. With a prime location along Charleston's Meeting Street, in the heart of the historic district and bordering the beautifully scenic Washington Square Park, it's possible for newcomers to overlook this stately but relatively conservative structure. 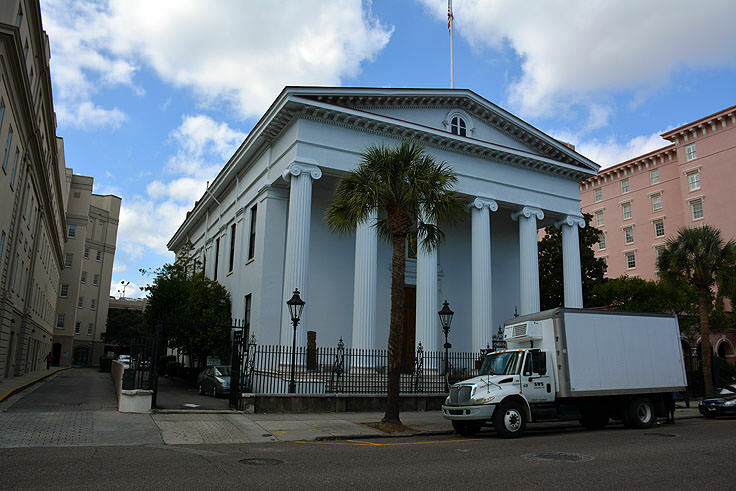 That being said, like many of Charleston's landmarks, this handsome building holds a large legacy as home to one of the most pivotal political party conventions in history - a meeting which would end up ultimately putting the wheels of the Civil War in motion. 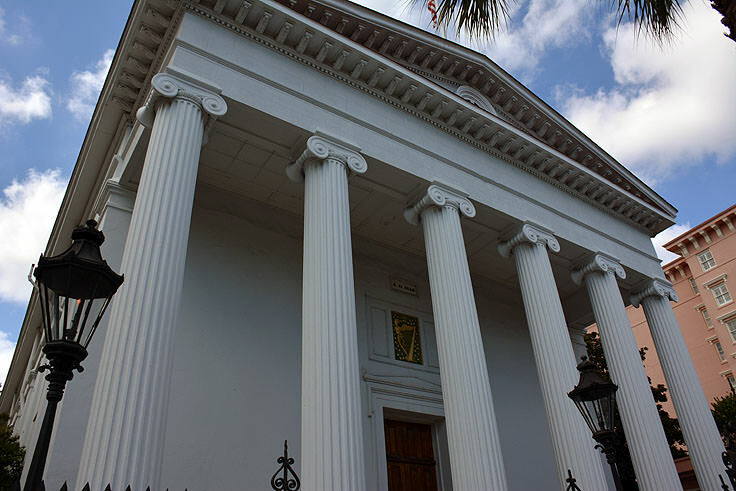 This legacy and classically distinctive architecture combine to make Hibernian Hall one of historic Charleston's most overlooked but inherently fascinating attractions. 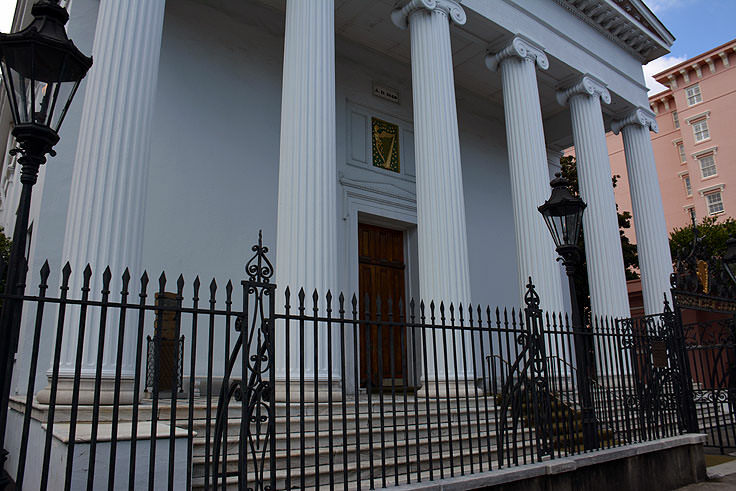 A signature spot in the heart of the historic district, Hibernian Hall is a landmark that is not to be missed on any downtown Charleston walking tour.